World’s 4th largest single-building airport terminal at 563,000 square metres, and handles more than 45 million passengers a year. The main terminal roof is designed with structural elements and bays placed in a cantilevered wavelike form. This canopy comprises eight super-truss girders with a central span of 126 metres and two cantilevering ends of 42 metres long. The entire roof is supported by 16 frame-type steel columns. Its glass wall utilises a cable truss system. 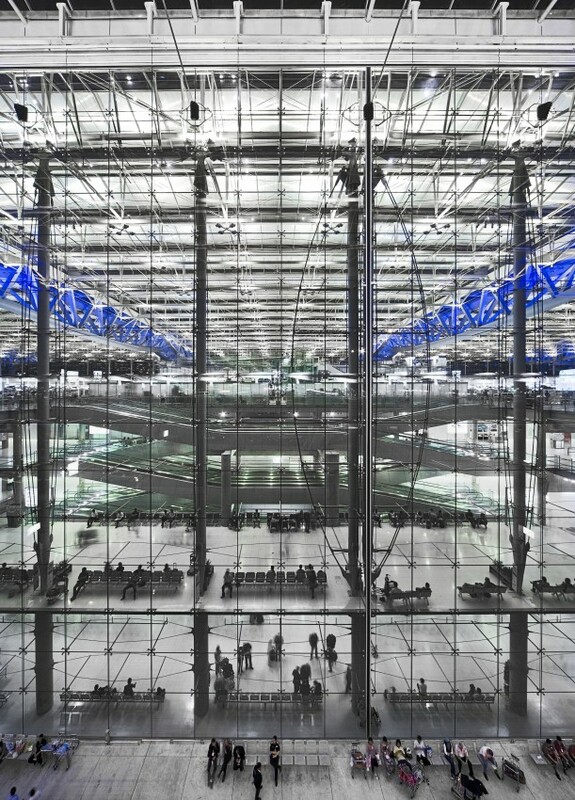 Internally, the concourse enclosure consists of five-pin arch truss girders with an alternating system of glazed façades and a translucent fabric membrane set-up, which is spanned to bridge the 27-metre spacing between the glass façades. The low-E coated glass façade system and the three layer-translucent membrane helps to mediate between the tropical climate and interior, reduce the noise transmission, and optimise the daylight into building.